The Fox in Charge of the Henhouse: Activists Decry Trump’s EPA Pick, Coal Lobbyist Andrew Wheeler | Democracy Now! national field director for Moms Clean Air Force and former Southeast regional administrator for the Environmental Protection Agency during the Obama administration. director of the Sierra Club’s Beyond Coal campaign. AMY GOODMAN: This is Democracy Now! I’m Amy Goodman, as we turn to the Senate confirmation hearing for former coal lobbyist Andrew Wheeler, President Trump’s nominee to become the administrator of the Environmental Protection Agency. Wheeler has been the acting head of the EPA since Scott Pruitt resigned in July amidst this onslaught of financial and ethics scandals. Wheeler is a former lobbyist for Murray Energy, the nation’s largest underground coal mining company, also the former chief of staff for Oklahoma Republican Senator Jim Inhofe, who is known as the most notorious climate change-denying lawmaker in Washington. Shortly after Wheeler began his opening remarks, he was interrupted by protesters. PROTESTER: Senator, I really must object to this hearing happening during the government shutdown! SEN. JOHN BARRASSO: Please remove. Please restore order. Will the officers please restore order in the committee room? PROTESTER: [inaudible] homeland this man wants to deregulate! This is an outrage! Shut down Wheeler, not the EPA! SEN. JOHN BARRASSO: Please restore order. AMY GOODMAN: Since taking over as acting director, Andrew Wheeler has overseen proposed rule changes that would make it far easier for coal-fired power plants to release mercury and other toxins into the atmosphere. The plan proposed by the Environmental Protection Agency would change how the federal government calculates the costs of pollution on human health, dramatically downplaying the financial burden to society from deaths and illnesses. Wheeler pledged, if confirmed, he would continue to push the Trump administration’s deregulatory and pro-fossil fuel agenda. Through our regulatory reforms, the Trump administration is proving that burdensome federal regulations are not necessary to drive environmental progress. What makes our actions effective and durable is our commitment to vigorously enforce them. AMY GOODMAN: The hearing was marked by tense exchanges with Democratic lawmakers, who questioned Wheeler’s understanding of recent reports assessing the impact and severity of the climate crisis and his commitment to addressing it. This is Vermont Senator Bernie Sanders. SEN. BERNIE SANDERS: I found it interesting, Mr. Wheeler, you are the nominee to be head of the Environmental Protection Agency. You just, in your opening statement, did not mention the word “climate change.” Now, how does it happen that the nominee to be head of the Environmental Protection Agency does not mention the words “climate change” at a time when the scientific community thinks that climate change is the great environmental crisis facing this planet? Should the American people have confidence that you are going to help us deal with this global crisis? ANDREW WHEELER: Yes, they should have confidence, because we are moving forward to reduce CO2. Our ACE proposal will reduce CO2 approximately the same levels that the Clean Power Plan would have, if it had been implemented. And we’re reducing CO2 from our CAFE standards. And we’re also addressing greenhouse gases through our methane program, as well. SEN. BERNIE SANDERS: You’re addressing. SEN. BERNIE SANDERS: But the scientific community tells us that we have a crisis and that we need unprecedented action. AMY GOODMAN: For more, we’re joined by two guests. In Washington, Heather McTeer Toney is with us, national field director for Moms Clean Air Force, inside the hearing room Wednesday, former Southeast regional administrator for the EPA under the Obama administration. She also served as the first African-American, first female and youngest mayor of Greenville, Mississippi. And in San Francisco, California, we’re joined by Mary Anne Hitt, director of the Sierra Club Beyond Coal campaign. We welcome you both to Democracy Now! Heather McTeer Toney, you were in the room as protesters tried to disrupt the hearing. What are your concerns about Andrew Wheeler, the former coal lobbyist, becoming the official head—he’s been acting head—of the Environmental Protection Agency, and his record so far? HEATHER McTEER TONEY: Well, thank you so much, first of all, for welcoming us here. And while our moms were in the room—we were there—we were not a part of the active protesters. I think the most you may have heard from us may have been some hungry toddlers, but that was about it. We are there, and we were there, to be more concerned and address our issues as mothers. When we see someone who is trying to be the top environmental protection person for our country, who does not even acknowledge climate as a major crisis in this country, in this world, that’s a problem for us. Our more than 1 million moms from around this country have dedicated themselves to fighting against air pollution that impacts our children’s health. And so, we are very, very concerned that Mr. Wheeler is not only not concerned about our children’s health and protecting it, but he’s not making the active actions that we know need to take place in order to really move this country forward. AMY GOODMAN: I want to go to Oregon Democratic Senator Jeff Merkley questioning the former coal lobbyist, Andrew Wheeler. SEN. JEFF MERKLEY: On a scale of one to 10, with 10 being you stay awake night worrying about it, and one being it occasionally crosses your mind, how concerned are you about this devastating impact on our nation and the world? ANDREW WHEELER: I would say I stay awake at night worrying about a lot of things with the agency. SEN. JEFF MERKLEY: One to 10: Please answer my question, not answer some other question. ANDREW WHEELER: I would say eight, eight or nine. SEN. JEFF MERKLEY: One-to-10 scale, how concerned are you? ANDREW WHEELER: Eight or nine. AMY GOODMAN: Eight or nine. Mary Anne Hitt, you’re the director of the Sierra Club Beyond Coal campaign. Your concerns? MARY ANNE HITT: Well, if Andrew Wheeler is an eight or nine, perhaps the scale should have been a 100, because every single action he has taken since he has been acting administrator has been to roll back climate standards and clean air and water standards, whether it’s standards for power plants, for cars, for methane pollution from oil and gas drilling. And as a lead lobbyist for coal industry and for Murray Energy, you know, they have never met an environmental regulation that they did not want to roll back. And he is checking off that wish list of the coal industry. And it is the fox in charge of the henhouse. It’s the bank robber in charge of the vault. You name it. But this really puts the everyday health and safety of regular Americans at risk, because this is the agency that’s inspecting our drinking water facilities and our power plants and chemical plants, cleaning up Superfund sites. And this man just cannot be trusted to lead that agency. AMY GOODMAN: I want to go back to Andrew Wheeler speaking during his confirmation hearing about rollbacks on the Clean Power Plan and Mercury and Air Toxics Standards. ANDREW WHEELER: Under our preferred option, I do not believe there would be a weakening in the mercury standards at all, as far as the equipment that has already been deployed and implemented across the board. I know it’s—I don’t think you can—you know, I get accused of rolling back the Clean Power Plan. I don’t think you can roll back regulation that never took effect. And on MATS, I don’t think you can roll back a regulation that’s been fully implemented. AMY GOODMAN: Mary Anne Hitt, the Sierra Club published an article saying Wheeler “cooked the books to help coal barons” with regard to the Mercury and Air Toxics Standards, or MATS. Explain this. MARY ANNE HITT: So, mercury gets into our bodies because it comes out of the power plants, gets into the water and the fish that we eat. And it poses a real threat, especially to little babies and small children. And what they have done—it is just—his comments are so cynical, it’s shocking. But what they have done is that—when they passed the mercury standards in the Obama administration, it also cleaned up a lot of other pollution, a lot of other kinds of air pollution, the kinds of air pollution linked to things like heart attacks and strokes. And what they’re trying to do here is to say, in putting forward this mercury standard, you can’t count all those other benefits to public health. All you can count is the very narrow category of mercury, which is a big public health problem, very important, but you can’t count all those other public health benefits. And now, it’s important to note, this rule has taken effect. Every coal plant in the country has complied with the mercury standards. Mercury levels have fallen 80 percent from power plants in the last 10 years. This is a huge public health success. But they’re trying to say you cannot count all those other health benefits, and, really, ultimately, tip the scales so that the benefits of these public health rules look smaller, the costs look greater, and they can make the case, going forward, that they can really narrowly look at the benefits of these public health protections to make the case that they should be weaker or shouldn’t have to comply with them at all. So it’s really trying to tip the scales in favor of polluters and against public health. And mercury is an issue that affects all Americans. It’s in the fish that we eat. Moms care about it so much. Any woman who’s been to the doctor has been warned away from eating fish with high levels of mercury. And so, this is a real bread-and-butter issue for folks. And they’re trying to put their finger on the scale in favor of the big polluters, which is typical for Andrew Wheeler and typical of, I think, what we would expect of him going forward. AMY GOODMAN: New research from Harvard University finds Trump’s plan to roll back Obama-era climate regulations in favor of more industry-friendly policy under the Affordable Clean Energy Act will result in a, quote, “rebound” in global warming and is worse than the government doing nothing to combat climate change. Trump’s plans, which included delaying the closure of coal-fired power plants, would lead to an increase in carbon dioxide emissions of 8.7 percent in 18 states and Washington, D.C., by 2030, compared to having no policy. Heather McTeer Toney, if you can respond to this? HEATHER McTEER TONEY: Unconscionable and unfathomable that we’re talking about putting someone in this position who has not even read the reports that we’re referring to. He’s not even been brought up to speed or found it important enough or concerned himself enough to go and research this information for himself. Our mothers have at least done that. The international report, and even the National Climate Assessment that our own government conducted, has confirmed from us that within the next 12 years, if we do not take some action to reduce carbon emissions in this country, that we will be in a position that is irreversible. I’m the mother of three. My youngest is 2 years old. That means that by the time he turns 14, before he is able to drive and before he has graduated from high school, we will be in a position where we cannot reverse the effects of extreme weather events in this country. This is not an issue that he has the option of thinking about whether or not it’s impacting our country. It is critical to the health and survival of all American citizens, particularly the least of us, our elderly and our children. And it’s very disappointing for mothers to know that he’s not even concerned about this. AMY GOODMAN: I wanted to talk about the effects of the shutdown on the climate. Website InsideClimate News recently reported the government shutdown has effectively halted several climate-related government efforts. They include the EPA’s work on studying the impact of wildfires, on air and water quality, health and the environment, and research and development from the National Hurricane Center on forecasting models for the next hurricane season. Climate scientists are also concerned about possible gaps in data collection, if instruments that assess planetary changes malfunction due to lack of maintenance. Finally, Heather McTeer Toney, if you could comment on that? But also, I mean, you were the youngest mayor of Greenville, Mississippi. Then you went on to the Obama administration. Why have you focused your activism on the climate? HEATHER McTEER TONEY: You know, it’s a very good question and one that a lot of good friends have asked, is: Why, at this point in time, is this the focus? And I believe, wholeheartedly, that if this is not the activism, if this is not the social justice movement, if this is not what we are concerning ourselves with right now, then everything else is for naught. We have one planet. We have one Earth. And it is imperatively important that we do what we can right now, within the limited time scope that we have, to make sure that we are in a sustainable and livable community. Working for the Environmental Protection Agency, there’s one thing that I always remembered. And that is, the first part of our mission statement was to protect human health and the environment—human health—because without that, we have nothing. And so, it is critically important for not only me, but also our more than 1 million moms, dads, grandmothers, cousins and aunts around this country to come together and make sure we are very vocal and activists in assuring that climate and our protections for our children are the top priority in this country. AMY GOODMAN: And can you talk about how communities of color are particularly impacted, on the front lines of, in their proximity, for example, to the coal-fired plants? HEATHER McTEER TONEY: You know, over a million African Americans live within one mile of an oil and gas operation. And a lot of people don’t recognize that fence-line and front-line communities are the first people who are impacted by any change in regulation. So, when we talk about the rollback of MATS, the Mercury and Air Toxics Standards, and the fact that the simplest thing that we all should make sure of is that we’re not putting poison in the air that impacts unborn babies, that impacts children—and when that’s done, the first place it gets to are those fence-line and those front-line communities of color. Those are the people that are impacted first. And so, to see this administration even moving in the direction of not only impacting unborn babies, their brains—because that’s what mercury does—but then it is to the communities of color, again, it is unimaginable that we’re even still considering having Andrew Wheeler as the nominee, when he has so evidently shown his disregard for communities of color and for young children. So, as you can tell, I’m very passionate about this. But it’s—I think it’s also important for us to know that our moms are working, that we know that there are activists that are out here that are not sitting quietly by, that we’re working. 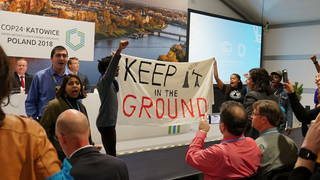 AMY GOODMAN: Heather McTeer Toney, we’re going to have to leave it there, national field director for Moms Clean Air Force, and Mary Anne Hitt, director of the Sierra Club’s Beyond Coal campaign. That does it for our broadcast. I’m Amy Goodman. Thanks so much for joining us.